When, Morpheus asked Neo in the mind boggling movie, THE MATRIX, if he wanted to have the RED Pill or the BLUE Pill, neither of them knew that in India, such choice is never given to a new born. "The red pill and its opposite, the blue pill, are popular culture symbols representing the choice between embracing the sometimes painful truth of reality (red pill) and the blissful ignorance of illusion (blue pill). Redpills are people who have chosen to face reality, while bluepills remain living in ignorance of the truth, whether by choice or because they have not had a choice." NOW, THE TIME HAS COME. Save Family Foundation (Regd. 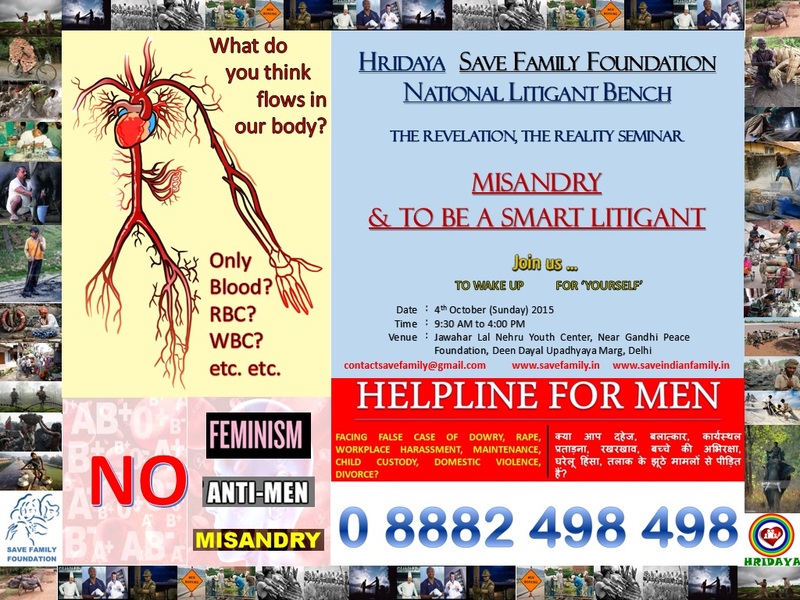 NGO), in collaboration with Hridaya - A Nest of Family Harmony & National Litigant Bench, announces the session where all Mr. Andersons would be rediscovered as Neos. And to make Neos smarter, NLB gives the sweet treat of "HOW TO BE A SMART LITIGANT". With the advancements of Medical Sciences, virtually, every anomaly in Human body is discoverable and most of these are done via simple blood tests. But let us ask a simple question, IS THAT ONLY WATER/WBC/RBC/HEMOGLOBIN etc. running in our Blood? 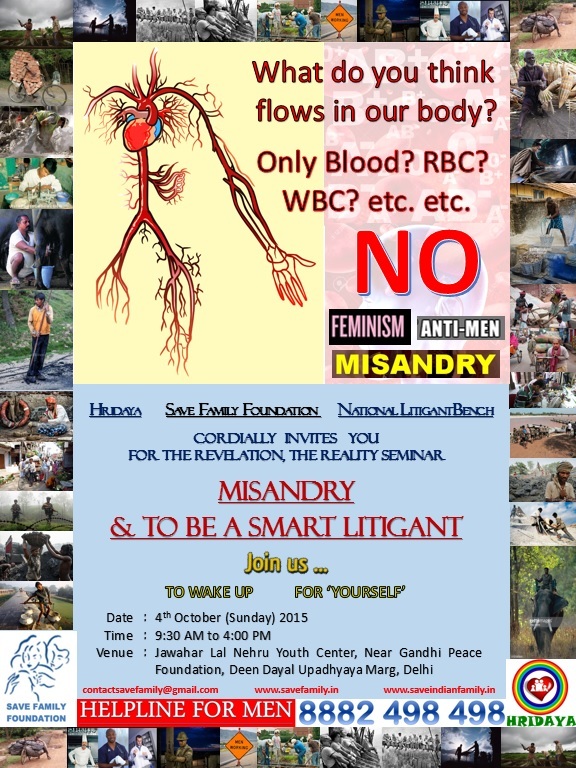 What runs in our blood is deeply ingrained Feminism, deeply ingrained Male Hatred and deeply ingrained MISANDRY. For more details, pleas call SIF One Helpline on 8882498498. Like always, there are NO CHARGES / ENTRY FEE for the Seminar. Updates about the event will be done on it's Facebook Event Page. Copyright (Delhi Team). This Blog is Owned by Save Family Foundation, Delhi, Regd. NGO.. Awesome Inc. theme. Theme images by molotovcoketail. Powered by Blogger.